OK! Back to those few Chicago posts I still need to finish up. Being a fan of Saturday Night Live and burgers, can't leave Chicago without visiting Billy Goat Tavern right? Staying at the Intercontinental Chicago, we were fortunate to be a hop, skip and a jump away from this place. Its located on the lower level of Michigan Avenue, so its got that dark dingy feeling pretty much all day. For those of you not familiar with the SNL reference, the tavern was honored as the reoccurring Olympia Cafe skit played by John Belushi, Dan Aykroyd, Bill Murray and Loraine Newman. 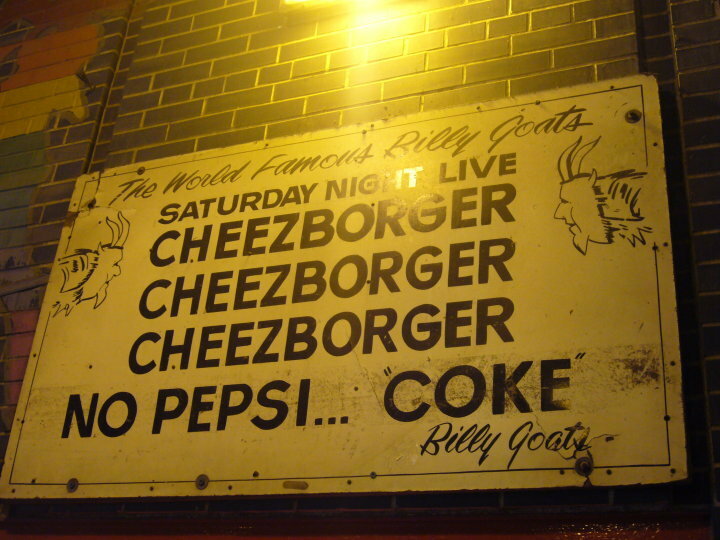 My experience at Billy Goat Tavern wasn't as outrageous as an SNL skit but it was still ... quite an experience. I actually think that the outlandishness of the skit rubbed off a little on the staff. But what do I know? I wasn't around to see what it was like before SNL put it on the map. Upon immediate arrival, the cashier yelled "Cheezborger, Cheezborger, Cheezborger!, Cheeps! No Coke! Pepsi!" at us. Uhm ok... I guess I'm having a cheezborger? After perusing the menu, I think we were convinced to get the double cheeseburger. The cashier sized up EHK and suggested it... and well I can eat too! Was the burger something to write home about? 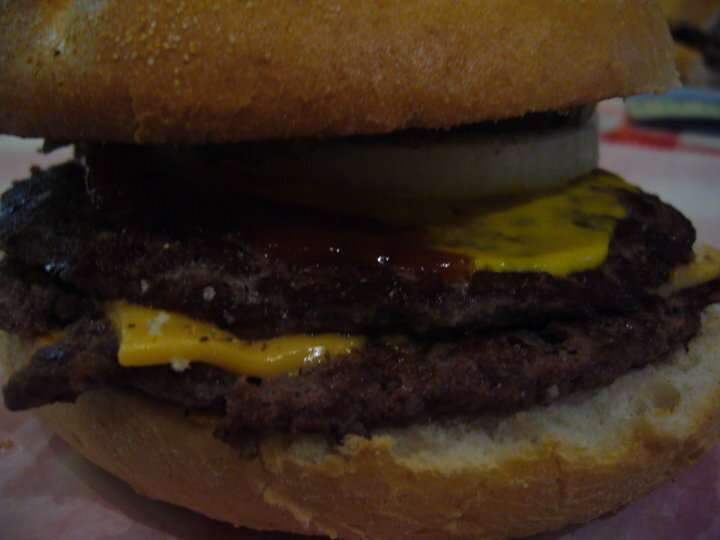 It was an okay burger, thin patties.. not overly juicy, buns made up most of the burger, and ugh... raw onions. My heart still belongs to grilled onions and Rocky's. What I liked about the place was the novelty. Its a greasy joint, got the usual sports memorabilia and of course the antics of the staff. I'd come again for the entertainment and a bite to eat if I were in the neighborhood.